Dubrovnik area has been blessed with countless beaches with crystal-clear sea. Your greatest task during your Dubrovnik holidays will be finding the time to explore all of them. Most of the beaches in Dubrovnik region are pebble and rocky. The sandy beaches make smaller number of Dubrovnik beaches. All city beaches area easily reachable on foot or by short bus ride. The only sandy beach Sunj beach on the island of Lopud can be reached by boat from Gruz port in only 50 minutes. The most popular beach, Banje beach, is situated just outside the city walls and here you can sunbath and swim with a view to the Old Harbour and the island of Lokrum. Heading to the south there is St James beach, smaller beach with also great location, popular among both locals and tourists. If your accommodation is in the Old Town and don't want to go anywhere you can refresh yourself on Porporela, which is located outside the St John's fortress. There is also Buza beach, an unique place which can be found on the boulders at the bottom of the south wall of Dubrovnik. It is ideal for young couples in search of romance and adventure. Buza is not recommended for families with small children, elders and those with physical disabilities. There is an attractive bar where you can refresh during the day and night. Just across the Old Town the island of Lokrum is located. This island is a popular day trip destination during hot summer days and can be reached by ferry in 10 minutes. Rocky spots you can find along the island are ideal for relaxing and sunbathing. For those staying in Lapad, they can reach beach only short walk from their accommodation. Along bay of Lapad there are numerous beaches and rocky spots ideal for swimming during hot summer days. The largest is Lapad bay beach which is located next to Hotel Kompas. 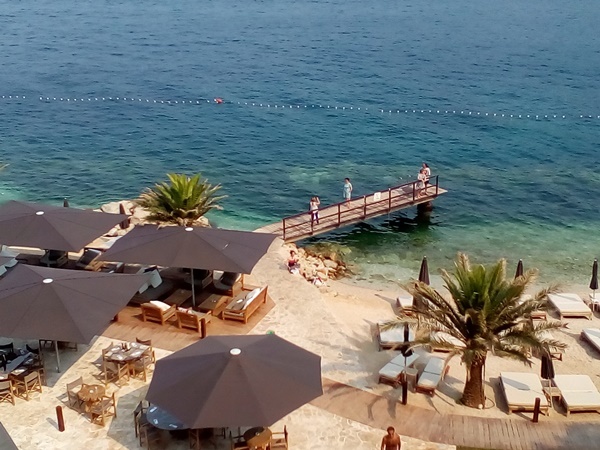 Great beaches are also those located beneath following Lapad hotels: Hotel Adriatic, Hotel Vis and Hotel Splendid (beaches are open for public use). Babin Kuk has also great choice of beaches. Copacabana beach is located beneath Valamar Hotels and it is ideal for families with small children (Aqua park is located there), young people and elders. On this beach you can find beach bar. Not far away from Copacabana beach there is Cava beach. On this beach you will find Coral Beacg Club with a range of services such as restaurant, bar, massage etc. Beach is equipped with comfortable sunbeds and parasols. At the tip of Babin Kuk several hotels are located. There is a beach beneath Hotel Valamar Dubrovnik President. Big pebble beach equipped with deck chairs and parasols are for guests use only, but there is a large concrete area (deck chairs and parasols available for rent) with ladders to enter the sea. There is also a small pebble beach at the very end which is ideal for families with small children. There are also changing cabins and showers available. On this beach you will find Abyss sport centre that offers sport activities such as: banana rides, water sky, parasailing, diving etc. Sunj beach is a sandy beach located on the island of Lopud (Elaphite islands), at the far end form the main village. The beach is nice, sheltered and ideal for everybody. There are a beach restaurant, public toilet and a small changing cabin at the beach. You can reach the beach by Jadrolinija's boat from Gruz port in 50 minutes (after disembarking the boat you need to walk for about 20 minutes or take a taxi golf cart which will ride you there in only 5 minutes). If you wish to explore each of the Elaphites in one day you should book a boat tour departing from Dubrovnik in the morning.